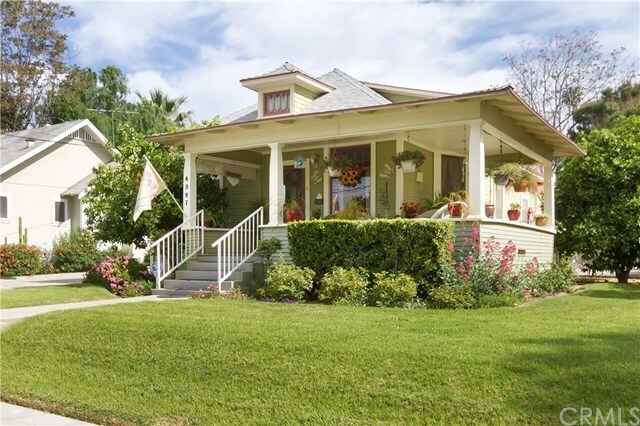 This absolutely charming Craftsman home built in 1910 is located in one downtownâs premier areas of Riverside. The warmth and charm of this home is immediately felt upon entering onto the polished original hard wood floors in the living room and separate dining room along with lots of windows that bring in the natural light. The kitchen has been completely remodeled with new flooring, all new cabinets and appliances, butcher block countertops and a walk-in pantry. Unique to a vintage home is an inside laundry room with lots of space and remodeled Â¾ bathroom directly off of the kitchen. On the main floor is the master bedroom with two additional bedrooms and remodeled full bathroom. Upstairs is a completely finished and insulated attic that can easily be used as a 4th bedroom. The spacious backyard is wonderfully landscaped and designed with 2 sitting areas. The extra deep pull around parking leads to the detached two car garage with electric roll up door. In addition, this home has new carpet and paint, a fenced in dog run and the electrical has been completely redone â no knob and tube in this house. One of the best features of this lovely home is the wrap around porch, large enough to seat the entire family. Enjoy the evenings or entertain the family while watching the fireworks from Mt. Rubidoux on the 4th of July. Now's your opportunity to experience downtown living in a vintage home! Just blocks away from the Mission Inn, downtown eateries, and Mt. Rubidoux.